So let me start with my analysis. The first point is the Cinderella was not born a princess, she was normal person with no title (though some stories say that her mum was an aristocrat with a title). She was not some sissy who was waiting to be rescued. She was working in her father's house even though she was treated unfairly by her step mother, she still loved doing her work. She was strong and had respect for her father's memory. I like the fact that she was not sitting around dreaming of a guy in a white horse to come and rescue her. She was doing something while waiting for her break. It might have been forced on her but the point is that she was doing something. I really don't get when some ladies are not interested in doing anything for themselves because they are waiting for one guy to come and provide everything for them. I can remember vividly when two of my university classmates said that i was waiting for a knight on a white horse. Just because i refused to date someone at that time. In my mind i was like uhn? Did i tell you that i need rescuing? Did i tell you i needed a knight in a shinning armor? If the knight likes he should come on black, blue, orange or white horse i don't care. If he thinks by appearing on a horse i would instantly faint or do all those things girls do then he has got something coming to him. He has to work for me. I ain't no cheap thing. I like that Cinderella was a go getter. she saw an opportunity and she took. She went to the ball when her godmother dressed her in the finest ball gown ever. But what i loved was that she went to the ball to have fun not trap any husband. Fortunately for her the prince liked her even without knowing her name and family background. It means he liked her for who she was which means that she had a great personality. And that she was real or true to herself. I have been astonished to hear how girls go to certain places or parties to get men. The day i heard that ladies wear their sunday best to go to the Le meridian hotel in Uyo just so that they can sleep with the foreigners who are lodged there, i could barely close my mouth in surprise. If not because of the possibility of flies entering my mouth i would have probably left it open for a long time. Are you kidding me?! They dress up, sit at the bar order a cheap drink and wait for the men to come. Like what about herpes, HIV and other STIs uhn? Unfortunately i am not the type of the men, i am not tall or voluptuous or i would have gone there to investigate with a camera and put the men and girls on an epic reveal on youtube. That is all for now guys. 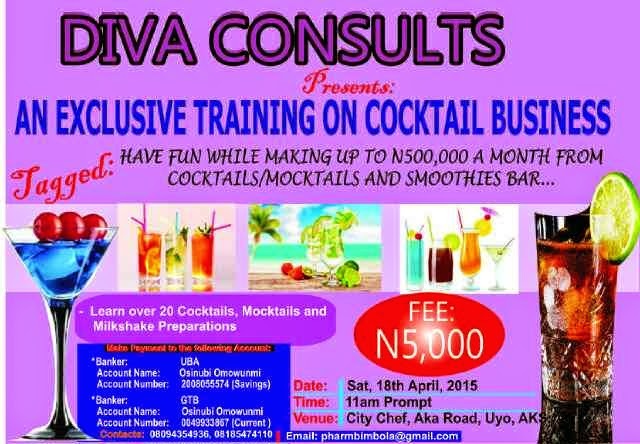 By the way have you heard about the training i am conducting in uyo. If no, where have you been? If yes, have you paid for it? It holds on the 18th of April 2015. You would not believe that during the clinical meeting of my department, one of my senior colleagues blew up the whole thing. She made me sound bigger than i am. I was so shocked and happy at the same time. I do hope that i get a lot of attendees. Quite a lot of people indicated interest in attending. Can you imagine that i just realised that i left the flyers at work? I wanted to take it to church on sunday and have it distributed. This is not good. Oh well, i still have three weeks to go. I loveeeeeeeee the story of Cinderella..I relate to it on a different level mehn!! !